All this knowledge and the market itself drew this group of cultivators to embark on a large-scale project upon seeing the results they were obtaining. In a short period of time, they professionalised their activity and carried out some exceptional work, preparing a cultivation with unique and top-quality genetics, focusing all their attention on achieving the best possible feminised strain. 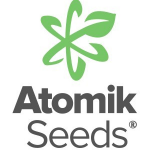 Atomik Seeds may be new to cannabis websites, fora, catalogues, magazines and in the best online and offline growshops, but they have been working professionally and efficiently behind the scenes for almost 10 years, and that is evident in the quality of the seeds.